We are constantly learning new things at our house. Of course, none of this enlightenment is the result of our own resourcefulness, but courtesy of the little people around us. Ouch. 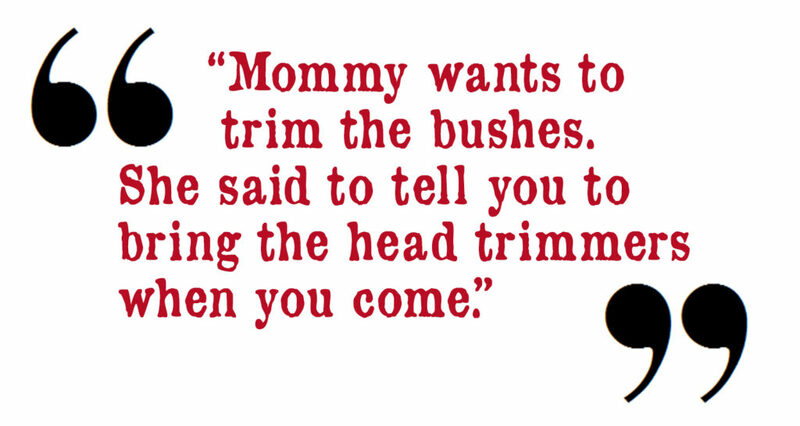 Seems like the hedge-trimmers would be less painful. That same grand also reported being outside and seeing a gardening snake. We’ve also been learning new things about anatomy. We are also learning wonderful ways to ramp up superlatives. Maybe the dictionary people will add that to their list of words. He said it with sincerity—as though I probably had a special place in the house picked out for the worm he had been rolling in sand. Sometimes it’s not what they say, but the way they think that is intriguing. The kid will do well in business. When we kept a couple of the grands for a few days, their mother told them that Grandma was going to be busy, but Grandpa would help them with their school lessons. It has been a long time since he has been in school, but he does remember a thing or two. They’re also creative when it comes to lending assistance, even if the assistance isn’t exactly on a professional level. When the husband had a problem with his cornea, our daughter told her twins it was hard for Grandpa to open one eye. Not the kind of health care he was hoping for, but it can always be worser. Take cover – the zucchini are coming!